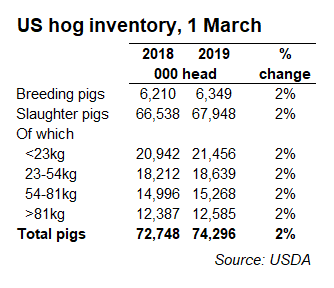 The US pig herd stood at 74.3 million head as of Match 1, 2019, which was 2% higher than March 2018, according to the latest quarterly report from the USDA. Both slaughter and breeding pig numbers reflected this 2% growth, totalling 67.9m and 6.35m head respectively. At 33m head, the December to February pig crop was up 3% from last year, as the number of sows farrowing during this time rose by 2% to 3.08m. Sow productivity, therefore, also increased on year earlier levels from December-February, with the average number of pigs weaned per litter rising to 10.70, compared to 10.58 in March 2018. AHDB lead analyst Duncan Wyatt said: “There can be little doubt that the US continues to have plenty of pigs, and is set to have even more. In the period March to May, producers intend to farrow 3.12m sows, 1% more than the actual number farrowing during the same period last year. Despite anticipated increases in production, in the past couple of few weeks pig prices in the US have been rallying sharply. There is optimism that the African Swine Fever (ASF) situation in China will continue to support the market.